Say goodbye to dirty basins and hours of drying time with the StylPro centrifugal brush cleansing system exclusive to Shaver Shop. StylPro was created when inventor Tom Pellerau had a conversation with a make-up artist about how much bacteria lurks on makeup brushes. Traditional cleansing methods leave unhygienic residue in the basin and take hours to air dry, meaning brush cleaning often gets put aside. The result? Built up dirt and grime on the fibres can clog pores, causing irritation, acne and poorly applied make-up. Seeing an opportunity to transform the beauty industry, Pellerau was determined to find a solution. 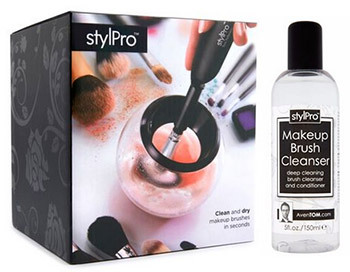 Enter the StylPro, a device that takes the hard work out of brush cleansing. The clever design enables you to transform the state of your brushes in seconds. Simply select the right attachment and insert the brush into the rinsing liquid and watch as it spins rapidly to remove built up bacteria. 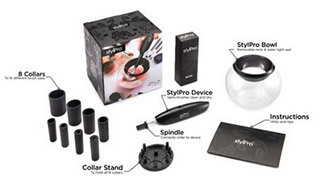 What distinguishes the StylPro from similar models is that once you remove the brush from the cleaning solution, the spinning function works to accelerate the drying process, giving you a clean, dry, ready-touse brush. The StylPro comes with a full range of attachments and is available online and in-store at Shaver Shop, Australia's leading personal grooming and beauty retailer for over 30 years.